On our way from Paris to the Cote d’Azur we stopped in the small ancient village of St. Emilion to taste the wines from the Bordeaux Region. Built on a hill, the steep cobblestone streets wind around small passageways leading to hidden cafes, wine tasting “caves” and small plazas in front of churches. 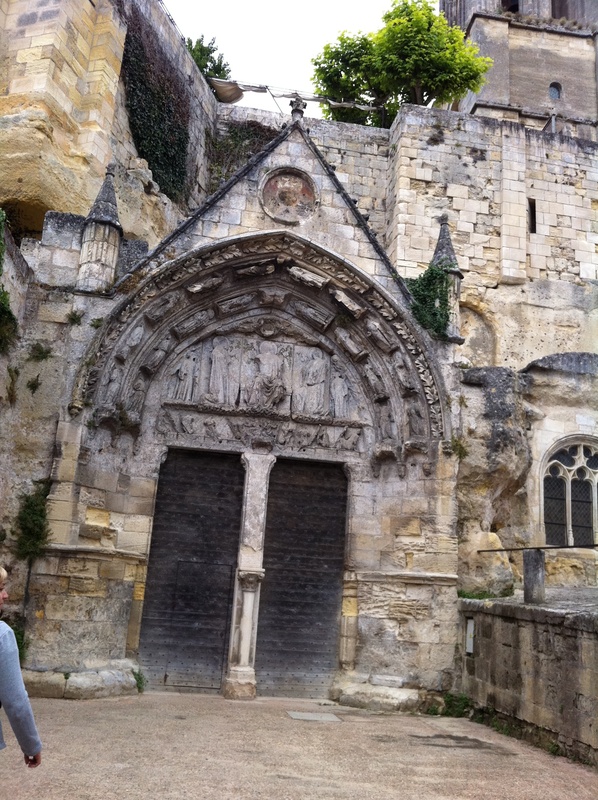 Established 2,000 years ago, St. Emilion is a village of Roman arches, several gothic style cathedrals and grape vineyards. Dating back to the second century, it’s history includes the Romans planting vineyards in the fourth century, monks settling in the eighth century –to the famous wines from the area today. Monk Emilion, a traveling confessor, stopped there in the eighth century and lived as a hermit in a carved rock. His burial site is in the center of the village via a narrow ally leading to an open area surrounded with arches. 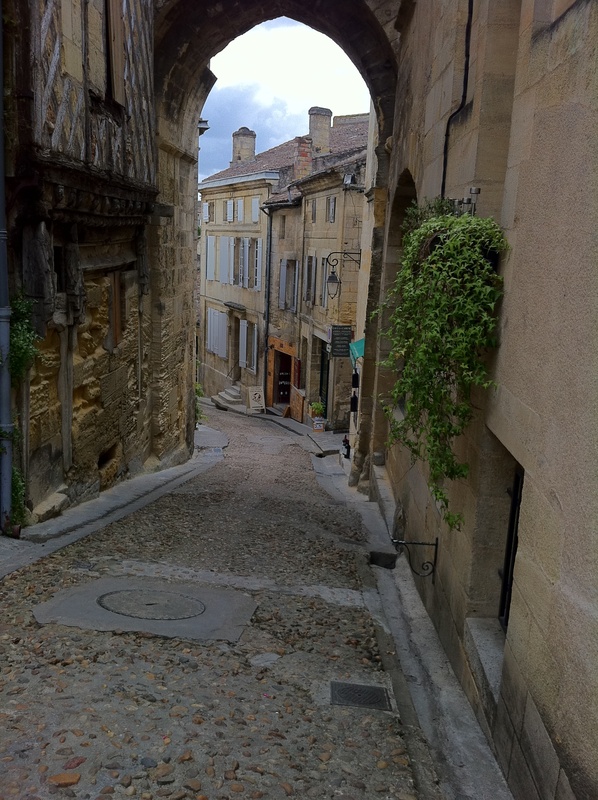 St. Emilion is not only known for their wines—they are also famous for their canales. The original recipe dates back to 1601, the pastries in shapes of little bundt cakes, are crunchy on the outside and buttery light on the inside– I’ve never tasted anything so delicious! The flavorful scent from the bakery drifts down the narrow streets in the early morning. We stayed in small hotel with a spiral staircase winding up to our room, in the center of town at the top of the hill. The “Au Logis Des Remparts” on the Rue Guadet has an inviting swimming pool in the gardens overlooking miles of vineyards. Traditional regional specialties are served on the patio at the “Le Medieval” a quaint restaurant located on the Place de la Porte Bonqueyre. We had coq au vin cooked with olives and a delicious Bordeaux wine. The “L’Alcove Restaurant Traditional”, owned by a husband and wife team, is a culinary experience. A casual restaurant where every dish served is gourmet –from the warm camembert honeyed salad, homemade sorbet with melon, mustard chicken –just to name a few. Located on 27 Rue Guadet, make sure you stop there on your way to wine tasting! Wine tasting at the Etablissements Martin, on the rue Guadet and La Grande Cave de Saint-Emilion, on 6 place du Clocher, offer a wide variety of wines from the area and the employees are very nice and knowledgeable.